Jamon meets design. 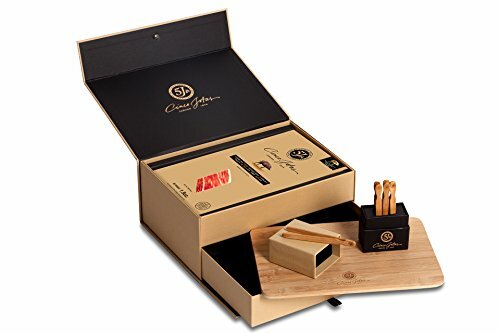 This elegant gift chest includes six 1.5 oz envelopes of thinly sliced Cinco Jotas acorn-fed 100% iberico shoulder jamon, a 5J bamboo cutting board, and a set of six bamboo tongs in their own wooden box. A gift that will not be forgotten. What makes 5J jamon special? Sánchez Romero Carvajal has been producing Cinco Jotas Iberian Acorn Jamon in Jabugo for over a hundred years, since 1879. One of the company's goals (some would say obsessions) has been to preserve the purity of the species- Cinco Jotas pigs are 100% pure Iberian, descended directly from the prehistoric Mediterranean boar. Almost all other jamon producers use cross-bred pigs of strains of up to 15% English, as English pigs weigh more and produce more offspring. The incomparable taste and quality of this Pure Iberian jamon is largely due to this attention to genetic selection, which undergoes strict quality control to guarantee and safeguard the purity of this inimitable breed worldwide. The long curing process of 5 Jotas Jabugo Jamon lasts 18-36 months (normally two years) and takes place in the natural cold environment of Sierra de Aracena outside the town of Jabugo. Jabugo's special microclimate and vast pastures make it the perfect environment to rear pure Iberian pigs and produce perfect pata negra jamon. The Maestro Jamonero or Master Jamon Craftsman supervises each stage in the artisan production of Cinco Jotas jamon, watching over it for days, months and even years with a critical eye, to achieve true "5J" quality. Once the jamones have been cured, they go through a rigorous selection process to ensure that only the best pieces, which reach the most exquisite organoleptic standards and which offer unrivaled quality, are selected. 5J Jamon has a lingering aroma and an incomparable taste and bouquet. When sliced, it has a uniform colour with myriad shiny streaks of accumulated fat. It is the most appreciated Spanish jamon in the world. If you have any questions about this product by Cinco Jotas (5J), contact us by completing and submitting the form below. If you are looking for a specif part number, please include it with your message.